According to a recent World Happiness Report, the Danes are the happiest people in the world. 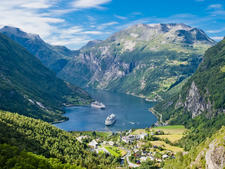 Whether it's the high wages and low unemployment rate or something magical in Copenhagen's salty sea air, a cruising visitor will feel the positive vibe -- and no doubt bring a little extra "happy" back to the ship. 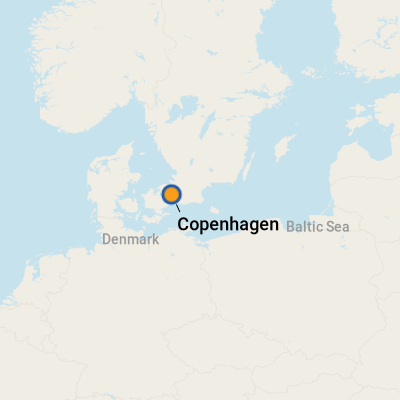 Sitting on the east coast of Denmark, Copenhagen has been the country's capital for 600 years, and it's the largest city in Scandinavia, with a population of 1.9 million people. It's home to the world's oldest monarchy (King Erik VII set up permanent residence in 1417), and its present Queen, Margrethe II, currently lives at Amalienborg Palace. A country rich in Viking history, grand castles and lush green countryside, Copenhagen is a charming city of 17th- and 18th-century buildings, beautiful parks and gardens, pretty promenades along canals, and ancient winding streets made for walking and biking. During the longer days and warmer weather of summer, outdoor cafe lounging and outings to magical Tivoli Gardens are highlights. To many, Copenhagen is synonymous with Hans Christian Andersen. Born in 1805, he's the author of such beloved fairy tales as "The Little Mermaid" and "The Princess and The Pea." Andersen's childhood home (now a museum) is located in Odense, about an 1.5-hour drive away, reachable by train. Getting your bearings in old Copenhagen is easy; it's a warren of pedestrian streets, bound by Norreport Station, Town Hall Square and the Central Train Station. Stroget, which is an amalgamation of five streets -- Frederiksgerggade, Nygade, Vimmelskaftet, Amagertorv and Ostergade -- runs practically smack-dab through the center of the city between Radhuspladsen and Kongens Nytorv. Pistolstraede is chock-a-block with galleries, restaurants and boutiques; Fiolstraede offers old bookstores; Straedet (parallel to Stroget) is lined with antiques stores; and Nyhavn is a popular restaurant zone. It's a pricey city, but a visit there is worth the splurge. You might want to consider getting the Copenhagen Card, which offers unlimited free access by bus and rail throughout the metropolitan area for 24 hours (multiple-day cards also available), as well as complimentary admission to more than 70 attractions and museums. Up to two children younger than 10 are allowed free with each adult card. Copenhagen offers three port facilities. Langelinie Pier, about 1.5 miles from the city's center, is a delightful port area with a series of shops and cafes, located a short 10-minute walk from the city's center. Taxis are also available. Look for a nearby Copenhagen Information Center with money-changing services and ATMs. Designed for the largest ships, the newest terminal, Ocean Quay, is in Copenhagen's North Harbour, Nordhavn. This sprawling industrial zone is too far from town to walk, and there are no services nearby. Fortunately, tour bus companies line up there at the cruise dock to take passengers into town to explore. You might also encounter a taxi or two if you're simply looking for a lift. Another port, Nordre Toldbod, is adjacent to the Copenhagen Kastellet and near the famous Little Mermaid statue. Note: Don't arrange for a taxi in advance to take you from the airport to the ship if you're arriving in Copenhagen because you'll pay for waiting time, which can run up the fare quickly. Take a taxi that's already waiting instead. You can take a short walk from Langelinie Pier to see the Little Mermaid statue or Amalienborg Palace. Langelinie's promenade is lined with shops, casual cafes and more. There's no reason to hang around the Freeport Terminal; the same is true of Ocean Quay. Be mindful of bike lines as you walk around the city or board tour buses. Fast-moving cyclists won't necessarily go around you if you're in their way. On Foot: Copenhagen is a great walking city, with most of its wondrous sights within a square mile of its center. A good place to begin a city tour is Town Hall Square; the Tivoli Gardens are across the street, and just north of Tivoli is Radhuspladsen, the central city square and the main terminal for the local bus network. To the east is the city's waterfront, including the canal district of Christianshavn. By Taxi: There are more than 1,700 government-licensed taxis that service Copenhagen, and most accept credit cards for trips of any length. Just make sure you tell the driver at the onset of your journey. Ask in advance to be sure your driver takes a credit card without a pin if you're using a magnetic strip card (common in the U.S.). You can hail taxis easily enough, and most drivers speak English. Taxi fares increase during the evening hours and on holidays. Drivers round up to the next krone, but no other tip is necessary. We recommend that you only ride in metered taxis. By Bus: From the cruise facility at Langelinie Pier, bus #26, which runs every 20 minutes, will take you to the city center. A waterbus near the polar bear statue at the end of the pier can also get you to the center of the city. (A one-day ticket lets you get on and off all day.) Taxis are plentiful for the 10-minute ride in. If you've disembarked at Freeport Terminal, take bus #27 to Kongens Nytorv or Radhuspladsen (town square). Taxis are generally available, as well. If you're at Ocean Quay, the best bet is to take a hop-on, hop-off bus tour of the city. A couple of competing outfits operate these tours, and the cost is roughly $20 to $25 USD. The tour itself lasts about 90 minutes and includes all the major highlights like Amalienborg Palace, Tivoli Gardens and the Little Mermaid, but you can jump off to explore at your leisure and pick up the next bus at the stop. You might also find a taxi at Ocean Quay that will take you to town, but that's not a sure thing, and you might spend almost as much on taxi fare as you would for the narrated bus tour. By Bike: Copenhagen has more than 1,000 white "City Bikes" that anyone can use within central Copenhagen, year-round, by inserting a coin into the bike's locking mechanism (one hour for 25 DKK). Designated bike lanes snake through town, and you won't be alone -- there are nearly two bikes for every resident of Copenhagen, they say, and it's one of the most bike-friendly cities in Europe. 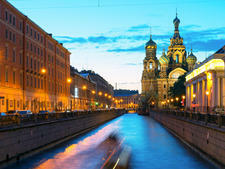 By Car: Car rental companies like Budget, Hertz and Europcar have offices in the city, as well as at the airport. 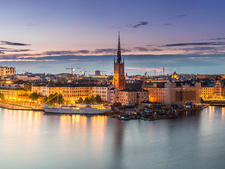 (Europcar is discounted for holders of the Copenhagen Card.) Check their websites for exact locations and prices. The cost of parking weekdays from 8 a.m. to 8 p.m. and Saturday from 8 a.m. to 2 p.m. is determined by zones (red, green and blue), and each has its own pricing. The farther away, the cheaper it will be. (The red zone is 35 DKK per hour, the green zone is 19 DKK, and the blue zone is 11 DKK.) Other times are free. Parking away from the city center is free for up to 2 hours. Tickets are purchased from coin-operated meters in the parking areas. From the Airport: Copenhagen Airport is 6 miles (9 km) from the city's center. Shuttle buses are generally available to cruise ships, but contact your cruise line for more information. If you arrive at Terminal 3, there are trains to town departing every 20 minutes; take the train to Osterport station. A taxi to Langelinie Pier takes about 25 minutes. Ocean Quay is also about 25 minutes from the airport. For travelers debarking or embarking there, Copenhagen has one of the most convenient rail services between downtown's main terminal (Kobenhavn) and the airport. The ride takes about 15 minutes. For travelers with a day to kill before flying, the rail station offers baggage storage. Denmark is one of Europe's hold-outs in terms of embracing the euro, so be prepared to master the krone. Beware of sticker shock at restaurants, hotels and shops. Currency exchange can be made in most banks, post offices and train stations. Banks are open Monday through Friday from 9:30 a.m. There are several exchange offices in the central station across from Tivoli Gardens that stay open late. For the best exchange rates, use ATMs, found almost everywhere. Danish, which is a bit difficult to master, is the language spoken. Generally, English is spoken and understood. Copenhagen Street Food Market: Denmark's best fare is arguably its open-face sandwiches or smorrebrod and its legendary hot dogs, which can be bought from the many carts scattered throughout the city. Dining at a sit-down restaurant can be expensive there, so you might want to consider grabbing a bite at Copenhagen Street Food Market, a former warehouse and docking area now lined with food trucks for frugal and fun dining. Torvehallerne: Another possibility is Torvehallerne, the city's covered food market, where food stalls and snack bars offer fresh fare and a lively atmosphere. Nimb: Try Nimb, a beautifully restored historic structure at Tivoli Gardens that houses an upmarket boutique hotel, deli, market, restaurant and brasserie. Aim for the latter, which, although a bit pricey, offers fantastic views of the grounds. (You might even catch a performance while dining on the terrace.) The food is traditional Danish with a contemporary flair. Fru Nimb Flaeskestegsbod: Looking for something a bit more basic and quick during your day at Tivoli? Pop into Fru Nimb Flaeskestegsbod for one of its tasty, inexpensive pork sandwiches. Spcafeen: Another option at Tivoli is Socafeen for Danish sandwiches and cold beer, overlooking Tivoli Lake. Royal Copenhagen porcelain or Georg Jensen silver are the two most notable souvenirs. If you're visiting from outside the European Union, you can get back some 18 percent of the 25 percent Value Added Tax (VAT) you paid on certain goods. You must spend a minimum amount per store, and items purchased must remain sealed and unused while you're in Denmark. You will need to carry your passport with you and fill in a form at the time of purchase. Present the forms to Customs at the final departure from the European Union, but keep in mind the agents most likely will ask to see the goods.